Walking or tracing a labyrinth, a simple yet ancient and effective practice, quiets the mind and takes you to a deep meditative place. From Lauren Artress, founder of Veriditas, the Worldwide Labyrinth Project, the lovely Sand Labyrinth kit can be used anywhere and anytime on tabletops, desktops, beds or laps. The kit includes a 10 square sandbox, with two traditional labyrinth patterns (for two different effects) which you can trace with your fingers in the sand. The accompanying book explains five basic uses of the labyrinth and offers wisdom from sages of all ages and traditions, along with testimonials from ordinary folks. For thousands of years, archetypal labyrinth patterns have been used as a powerful tool for resolving problems, access to inner peace, and spiritual alignment. A simple, yet highly effective practice, walking or tracing a labyrinth quiets the mind and takes you to a place where you can hear your own wisdom with clarity and calmness. 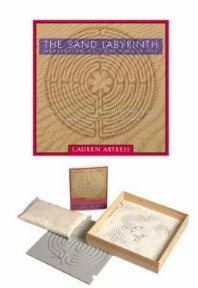 Author Lauren Artress, founder of Veriditas, the Worldwide Labyrinth Project and a renowned expert on the subject, offers a lovely labyrinth kit, to be used anywhere, anytime—on tabletops, desktops, beds or laps. 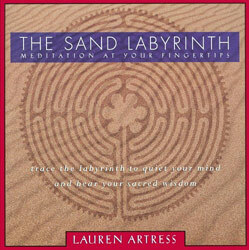 Included in The Sand Labyrinth are a 10" square sandbox and a double-sided labyrinth (flip over to change the pattern and create a different meditative effect), which is covered by a layer of fine white sand for finger tracing. The accompanying book contains five sections devoted to using the labyrinth for healing, creativity, discovering your soul assignment, awakening self-knowledge, and honoring your experience. You’ll also find words of wisdom from sages of all traditions and ages, plus testimonials from ordinary people who have found extraordinary results from the soothing, mesmerizing power of the labyrinth—to help deepen your meditation experience. Lauren Artress, D. Min., a psychotherapist and Episcopal priest, is the founder of Veriditas, the Worldwide Labyrinth Project and a Canon of Grace Cathedral in San Francisco. She is the author of Walking a Sacred Path: Rediscovering the Labyrinth as a Spiritual Tool and travels extensively in the United States and Europe, giving seminars on using the labyrinth for creativity, spirituality, and healing, including a one-month program in Chartres where she leads a pilgrimage for people to encounter the labyrinth.